Charles’ party looks like it’s going to be a big one judging by the amount of food sitting around the appartment. This morning we put together maybe 100 kebabs and I shredded more greens than I’d normally see in a year. Once again I took the time to repack my stuff and try to lighten my load. Some of that effort was negated by the amount of food I’ll be starting with. 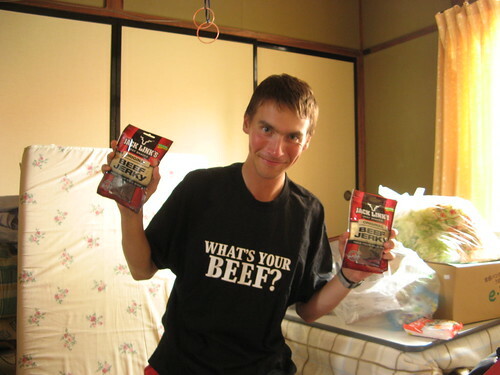 Thanks go out to Tania’s uncle of Jack Links who sent me loads of beef jerky that I’ll be chewing through on my way north. From now on I’m hoping to avoid carrying much more. I figure I have nibbles if I need them and everything else can be bought on the day.